TOWER GROVE — In 1994, late in the last stand of 16-bit consoles, a Super Nintendo baseball game gained the endorsement of All-Star center fielder Ken Griffey Jr. and approval of Major League Baseball, but it could not land the licensing rights from the Major League Baseball Players Association and could not use real games. For that, we are forever grateful. A lack of authentic names forced a stroke of genius. 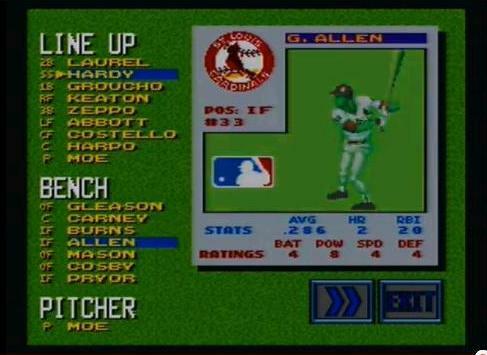 “Ken Griffey Jr. Presents Major League Baseball” brought some of the most creative lineups ever to gamers. Oh, if only they were real! Unable to have Cal Ripken Jr. as the starting shortstop for the Baltimore Orioles, Junior’s game instead had Baltimore native (and colorful film director) John Waters playing shortstop. The Colorado Rockies were loaded with famous movie monster actors, putting, as the game says, B. Legosi in center field and L. Chaney at first. 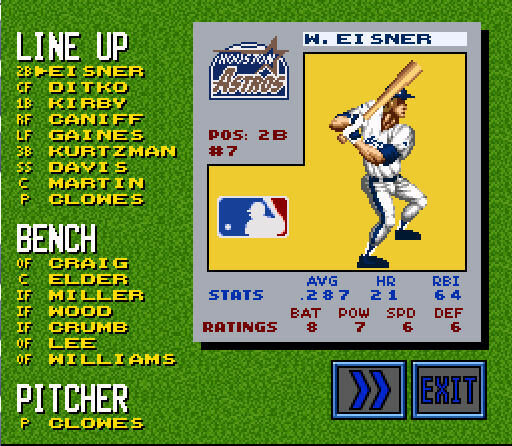 Griffey is playing center for the Seattle Mariners — hey, he endorsed the game — but instead of Jay Buhner, Edgar Martinez and Tin Martinez around him in the lineup are the names of Nintendo employees. The Kansas City Royals are former presidents. The New York Mets and Los Angeles Dodgers are punk bands from those areas, putting the city’s Joey Ramone against the coast’s Lux Interior. The Oakland Athletics have a lineup of authors such as M. Twain, L. Tolstoy and, filling in at first base fore Mark McGwire, is a bearded chap named H. Ernest. (Well, they can’t all be that obvious.) The most inventive of the lineups might be the Boston Red Sox, where Sam Malone is the ace and the characters from “Cheers” are his supporting class alongside other Boston fixtures, like G. Monster. There is something surreal about a keystone combination of Laurel and Hardy, and mind-altering about the idea that Hardy would have to do a back flip to truly fill the cleats of Smith. And who knew Buster Keaton, the stoic wonder, was such an imposing switch-hitting slugger on the ball field? Most of the names for the Cardinals will at least be recognizable, like the lineup for the Minnesota Twins that includes A. West (Batman! ), J. Hendrix (Experience!) and W. Herzog (Obvious!). Houston … not so much. The stand in for Craig Biggio is the creator of The Spirit. Not sure? OK, the center fielder playing the part of Steve Finley in Junior’s game is, fittingly, the co-creator of Spider-Man. Don’t know him? Well, Jeff Bagwell is actually one of the most famous and distinctive comic book artists of all time. He created Captain America and the forced perspective fist. No clue? P Howard Chaykin … American Flagg! The Astros aren’t the most obscure team on the game. That has to go to Toronto who is made up of rugby players from a club in England. (You can see all of the themes here; you can see one person’s attempt to lineup fiction with fact in this dedicated blog.) There isn’t that quirky connection in Houston either, not like The Wizard of Olly for the Cardinals or — and I kid you not — Phil Spector being the stand-in for John Kruk in Philadelphia. The Cardinals-Astros game isn’t going to give you those delicious showdowns that make this game a class: B. Wayne of the Milwaukee Brewers against A. West of the Twins; B. Stoker of Cincinnati crossing paths with B. Lugosi of the Rockies (Dracula can face his maker! ); and, perhaps the most awkward of all, when M. Monroe of the Cleveland Indians tries to score from third on a fly ball to New York Yankees outfielder Y. Clipper. A little disappointed they didn’t go with M. Coffee, but you get the idea. The Cardinals-Astros games may not have that kind of star power, but the genius of the game is that every team has a twist. Houston’s Shooter in the bullpen, Wood off the bench, and Spirit in the infield ought to be enough to keep up with the Cardinals’ comic relief (it’s The Stooges) and the catcher behind the plate who only calls pitches by whistling or tooting a horn. Now that’s a video game. This entry was posted in baseball, comics, journal, project 365+ and tagged cardinals, ken griffey jr., ken griffey jr. presents major league baseball, mad magazine, marvel comics, nintendo, oliver hardy, ozzie smith, st louis cardinals, stan lee, three stooges by dgoold. Bookmark the permalink. all very nice. Lots of homework done here except Larry from the 3 stooges last name on the show was Fine. Like on the door of their businesses…..Howard, Fine, & Howard. Good call, Jeremy. The Stooges’ initials threw me as I tried to decode the roster. Nice article. I really love this game. Kudos to that guy who spent all that time on the blog (www.kgjpml@blogspot.com) getting the rosters and names lined up (even though sometimes I liked using the joke names). The chi sox were always my favorite team. Bummer that Frank Thomas (and the rest) always had their home run stats erased. What a terrible glitch in an otherwise amazing game.